Bette belongs to a Hollywood icon. So why does it lag behind other silver screen star names, like Audrey and Ava? Thanks to Kenneth for suggesting today’s Baby Name of the Day. No question, this name belongs with the Elizabeth nicknames. Or maybe, sometimes, it comes from a surname – though Betts and Bettis are linked to Elizabeth, too – or maybe Beatrice or Bartholomew. It debuted in the US Top 1000 way back in 1902, peaked around the mid-20s, and left the rankings after 1962. That tracks with far more popular Betty, which reached #2 and spent years in the Top Ten. 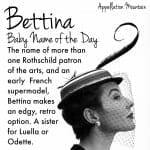 That might qualify Bette as an elegant alternative spelling, in the same category as Katharine or Madeleine. Bette: One Syllable or Two? Pronunciation remains open to debate. It might be just one syllable: bet. After all, Elle rhymes with bell. The famous actor and singer Miss Midler opted for this sound. Or maybe it’s another spelling for Betty. We typically say Emme like Emmy, so that makes sense, too. And arguably the most famous of all the Bettes went with this pronunciation. Born Ruth Elizabeth Davis, the future Hollywood icon was always known as Betty. The -tte spelling came later, inspired by Balzac’s La Cousine Bette. 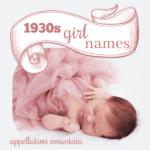 Davis was born in 1908, so she’s part of the name’s peak – not the reason for it. As for the 1846 novel, the Cousine in question plotted the destruction of her extended family as revenge. She’s stubborn and fierce, but motivated by money – and I’m not sure she’s admirable. A movie adaptation of Balzac’s work came in 1928, but that was seven years after Davis adopted the spelling. The young Betty-turned-Bette moved to Hollywood in 1930. She stumbled through early auditions and small roles, before getting a break in 1932. Her turn as One year later, she won her first Oscar for her role in Dangerous. Over her long career, she racked up ten Best Actress nominations, with two wins. Davis is counted among the greatest stars of classic Hollywood, known for playing strong characters, often difficult women. It adds to the name’s appeal, I think. Davis – and her remarkable eyes – even inspired a 1981 pop hit by Kim Carnes, making her familiar to a whole new generation. Betty reads sweet and simple, but this spelling? It adds some complexity to the name’s image. Some credit goes to Davis herself. But there’s another reason – one that may have inspired Balzac when he named his character. In French, bête means beast. The phrase bête noir translates to black beast, and refers to something to be avoided. In some uses, it’s used as a synonym for anathema; in other cases, it means something more mild. While it’s a negative concept, I wonder if it’s just enough of an edge to temper sunshiny Betty and make this spelling feel like a distinct name with an image all its own. Fun fact: the second famous Bette was named for Davis. Only Midler’s mother didn’t realize Davis pronounced her name Betty. 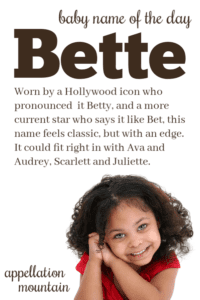 And so here’s a case for pronouncing the name like bet. Since Midler feels more familiar to parents today, that might explain why so many default to the single-syllable pronunciation. For years, the -ette spelling has teetered on the edge of obscurity. 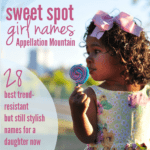 In 2017, fewer than five girls received the name, down from 14 the year before, and nine in 2015. And yet that might signal an opportunity. Betty isn’t back, either – that spelling last appeared in the US in the 90s. But we love Belle, a Disney princess name climbing in use. And Scarlett and Juliet/Juliette are enjoying significant popularity for girls right now. 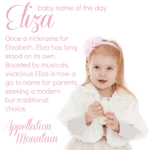 Do you like this name better as an Elizabeth nickname, or on its own? And would you say it like Belle or Betty?